Thank you visiting our shop. We are currently closed to move studio, and our shop will reopen again some time in April 2019. Thank you for your patience and sorry for any inconvenience caused. 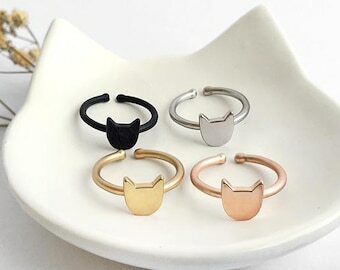 The cat ring is beautiful, I really loved it! These are very cute and I do love them, but I’ve only had them for about 2 maybe 3 weeks and the black on the cat has already started chipping off and leaving black residue on my ear when I take them out. I love it! It's so dainty and cute. A peak into our production studio where all our bioresin items are cast by hand. Our production 'bins' where stages of the production processes are neatly sorted out. Alfie the calico cat: the meowing inspiration behind the brand. A montage of me and our dearest Chairman meow! Alfie De Meow is a cat-inspired jewellery label with a social aim of helping cats that need our love and attention. The brand is inspired by our family-rescued calico named Alfie. We aim to help cats that need our love and attention by donating 10% of our sales to cat welfare group(s) based in Singapore. This year, we pledge our love to The Cat Welfare Society, in support of their Stray Cat sterilisation programme and special cases initiative for volunteer caregivers. All our items are designed in-house in our Singapore studio. The bioresin pieces are all cast, sanded and polished by hand in our Singapore studio. The metal pendents in our jewellery are made by our Etsy-approved manufacturer in Yiwu. Some of our acrylic pieces are cut by an Esty-approved laser cutter in Australia, and they are pieced together by hand when they reach our studio in Singapore. Custom orders for bioresin range are welcome! My favourite jewellery manufacturer when it comes to quality. They have excellent plating (smooth and very thick) and great finishing. Our jewellery manufactured by them almost never tarnishes. The founders of the company have had 10 years of designing and working experience with laser cutters. Hence, expect a quality and standard of the very best - including cutting the smallest details with the most perfect precision.